There are few things so subtle yet unmistakable in flavor than pears. Their juicy deliciousness is derived from both their delicate scent and more delicate taste. Even visually, they appear to be in utter repose, off in their own quiet conspiracy. I love working with pears. The perfume that releases once you’ve peeled and cored a perfectly ripe pear is beyond description. But how do you capture their quiet essence without overwhelming it with other flavors? Because pears go so well with caramel, various spices, nuts, wine, spirits, cheese or chocolate, it’s easy to let any of those other flavors take hold. But how to balance all of these other elements so you still have that faint-whisper sensation of pure pear? How do you render that pure essence so it’s in the forefront of your palate? It’s one of the hardest things to do and something I’ve thought about for years! While on this trail of simplicity, I’ve baked some ripe pears in a basic flaky sour cream pastry dough to highlight and exalt the fresh flavor and simplicity of the fruit. Unadorned, quiet and complete all on their own. - A few years ago I had the great fortune of sampling a plum kifli at Crixa, a terrific bakery in Berkeley that makes the most interesting Hungarian, Russian, Central European and American pastries and desserts. I searched and experimented for something approximating kifli dough. The pastry dough I use here is one version. - Although I am in a purist mood, you can of course add your favorite spices or minced ginger or golden raisins or whatever you’d like to the fruit. - These delicate pastries are to be eaten the same day. Combine the flour, sugar and salt in the bowl of a food processor. Add butter and process until the butter is reduced to small pieces and the mixture resembles coarse cornmeal for the most part. Add sour cream and yolk and pulse just until the dough starts to come together. Be careful not to overmix. Gather the dough on a piece of plastic wrap and seal it. Chill thoroughly. Remove the dough and let it warm at room temperature for a couple of minutes. Roll out to 1/8” and cut into desired shapes. Place cutouts on a parchment lined baking sheet and chill for 30 minutes. Place the juice of 1/2 lemon in a bowl large enough to hold the sliced pears. 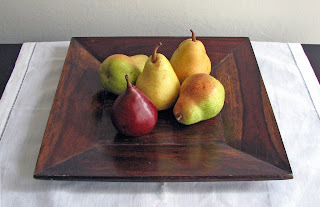 Prepare pears by peeling, coring and slicing or dicing them. Add the pears to the bowl and toss to coat with lemon juice. Add sugar and toss gently. 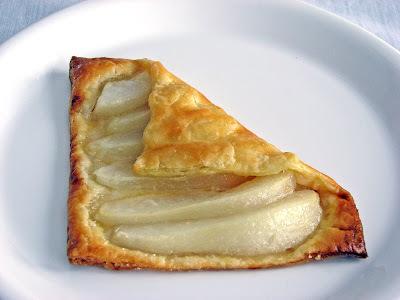 Remove pastry from the refrigerator and brush the pastry edges with egg wash. Top with pear mixture and seal. Place the pastries in the freezer for 30 minutes. Preheat the oven to 375 degrees. Egg wash the dough and sprinkle with a bit more sugar. Bake the pastries for 20 – 25 minutes until golden brown, rotating the baking sheet half way through as necessary to ensure even baking. Take in that aroma. Cool. Stare. Consume. This is such a visually stunning blog. That top image today is just terrific. My mind smells like pastry and pears. Mmm, exquisite. We thank you, oh Pastry Goddess, for gracing us with your creations! It's a lovely crisp morning here and just when I think it could not be more perfect, I read about peeling and coring a perfectly ripe pear and the morning goes to the next level of perfect. 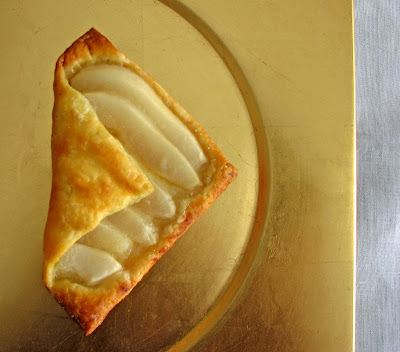 These pears in pastry shells are gorgeous! I like the asymmetry you use - you've made simple tart designs into an elaborately thought out work of art! The moment I saw these I thought they were so gorgeous - I had to make them. I added a bit of cinnamon and just a pinch of nutmeg. Amazing!